The Caddos in east and northeast Texas were perhaps the most culturally developed. They were successful agriculturists who lived in permanent abodes. It was a group within this tribe that the early Spanish authorities called the Tejas, which is said to be the tribes's word for friend. From this origin, the name evolved to become the name for Mexican province, then the republic, and now the state. The Karankawas ranged along the Gulf coast between present Galveston and Corpus Christi. They were loosly organized in a very primitive culture, and lived mostly fishermen. The Coahuiltecan occupied the region along the lower Rio Grand. Members of this tribe eked out a sparse existance of nourished mainly by roots, herbs, and prickly pear cactus. Because of their location remote from the main settlements of early Texas, they had little contact with the Texans. 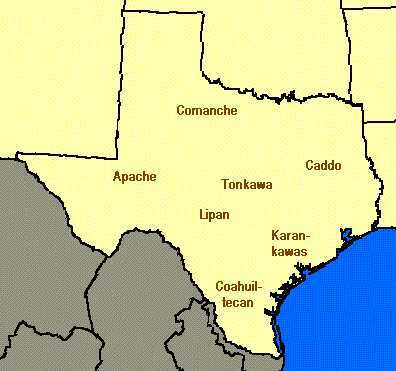 The Lipan, or Lipan-Apache, were among the more important subgroups of Apaches in Texas. They ranged the furthest eastward and had the most contact with the early Texas settlements. The Lipans fought the Texans, but on many occasions in the nineteenth century became allies of the Texans in campaigns against other Indians. Other related groups of Apaches, especially the Mescalero-Apache, ranged generally from west Texas into present New Mexico and Arizona. The well known Comanche tribes were relative latecomers to Texas, after migrating from the north and northwest. They were perhaps the most troublesome to the early settlers, and were also the most feared. Their mobility and horsemanship seemed to amplify their numbers in the eyes of the early Texans. The Tonkawa occupied the region of central Texas. Like the Comanche, they were very mobile and hunted buffalo, deer, and smaller game. In addition the these native Texas tribes, numerous others entered east Texas in the early part of the nineteenth century. They came as refugees from the increasingly populated areas east of the Mississippi. The more significant of these tribes included the Cherokee, Choctaw, Chickasaw, Kickapoo, and Shawnee.